where can i find shoes without any rubber in the soles? i read some research that separation from the earth, for example via insulative shoes and spending all day in buildings, is detrimental to health because we are electrochemical beings and our charge becomes too positive (too many electrons/free radicals). the soil/earth is negatively charged and adsorbs the excess electrons thus acting as a natural antioxidant bringing us back into balance. i'd like to walk without insulative shoes to see for myself. the only other suggested way to connect with the earth is to sleep with a foil blanket connected to a rod that is driven into the earth outside. that doesn't seem natural to me, although people seem to like it. 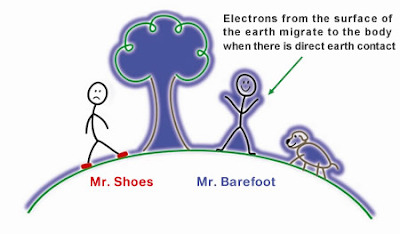 If you're keen to trample all over science, why don't you strap a pair of physics textbooks to your feet? You can find them at University Books and they're, like, made out of trees 'n' s**t. Natural, right? The weight of them will definitely keep you grounded. Though, if you want some balance, I'd suggest reading them instead. I'm sure that the inhabitants of Seattle will be grateful to A. Noyd for saving their reputation. If you want a longer debunk, see Your Friday Dose of Woo: "Grounded" in woo; or you could do the foil blanket and rod thing just to be on the safe side.